OS X is getting a bit slow at times, that’s why I thought of giving it a try with Linux installing both OS X Tiger and Yellow Dog. There are several Linux distributions available for those Macs made before Apple transitioned to Intel processors (i.e. PowerPC Macs with G3 G4 and G5 processors). Linux distributions I’ve considered were Ubuntu, Gentoo, Mandriva and openSUSE. 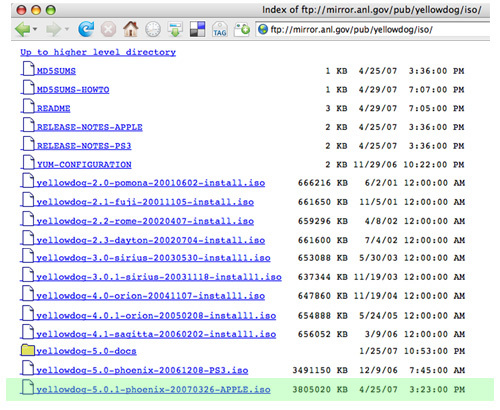 I ended up downloading Yellow Dog Linux 5.0.1 code-named Phoenix (from the TerraSoft website). This distro is free and its iso has 3.6 GB, I chose it because it’s the only one that’s made just for the PowerPC architecture and it seems to have a good support today and for the years to come]. The Yellow Dog 5 is a Fedora Core, RPM-based distribution. Download the .iso file (from the TerraSoft website) and burn it onto a dvd. If you are interested in the matter take a look at the TerraSoft site and here or here (in italian ->here). With Mac OS X running, insert the OS X Install Disc 1 that came with the Mac Mini. Run the installer from the disc and, when prompted, hit “restart”. The Mac Mini will reboot and load the OS X installer from the disc. 1 volume of 50 GB I have marked as “OS X” with the format “Mac OS Extended (Journaled)”, which is the Mac OS X filesystem, HFS+. Once done setting up the volumes as desired, click Partition on the lower right, and quit Disk Utility. You’re ready to install OS X onto the partition you just created (the 50 GB one in my case). Now OS X is installed, you only need to insert the YDL DVD and restart the system and make it so it will boot from the dvd-drive (I think I pressed C, I can’t remember). The Yellow Dog installation menu will appear and you will be guided to choose how to manage the Free Space partitions you have previously created. Once you have both OSs installed, when turning on the Mac Mini, instead of rebooting directly into Mac OS X as before, it will now load a bootstrap from which you can hit the letter “L” to boot Linux, or “X” to boot Mac OS X. By default (not hitting any key) it will boot the Yellow Dog Linux. After a few hours of Yellow Dog I had not figured out how to fix the sound (I had no sound!!!). There are some tweaks you really need to look after and it can take ages to find out. Things can be slow on OSX but they are hassle-free for the regular user. My suggestion is: Keep OSX as main system, install Yellow Dog if you are curious but don’t expect it to satisfy your regular needs (sound!!!). When I had Ubuntu up and running I was quite anxious to play with the new OS and customize it with my favorite apps. Some apps I was able to install via Add/Remove Applications (Azureus, Amule, VLC) quite easily, other apps I had to understand how Synaptic worked and read through the Ubuntu wikis. The first app I wanted to install was Skype and here I describe how I did it hoping it comes handy to other beginners like me. 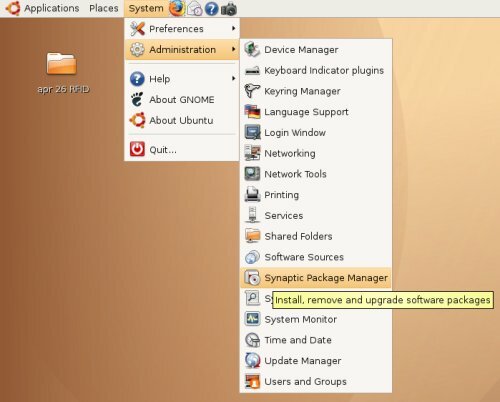 You will be asked for your system password, then a Synaptic Package Manager window will come up. This window shows the so called repositories which control the installation process and get the application packets from the Internet into the OS. 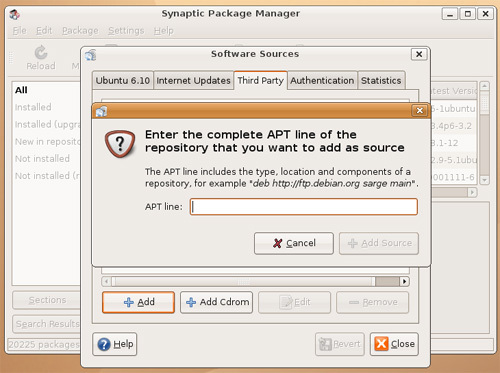 From the Synaptic Pagake Manager window click Settings>Repositories. From the new window Software Sources select the Third Party tab and click Add. then click OK and OK again until you get back to the Synaptic Package Manager.